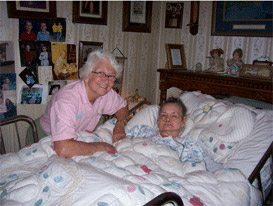 Roughly 90% of hospice care is given at home. Facing a life-threatening illness is one of life’s toughest challenges, both for the individual and for the family. Hospice Savannah brings an expert team to help you. Our team, composed of a physician, a registered nurse, certified nursing assistants, a social worker, chaplain and volunteers, can make this difficult time and its complications easier for everyone. Our team will come to your home, assess your needs, handle the paperwork, and provide the finest professional end-of-life care available. We provide the care the patient and family wants, where the patient lives. The principles of “hospice” involve pain reduction, symptom control, emotional and spiritual support, holistic nurturing of patient and family, and all within an atmosphere of compassion and understanding. Our team members often talk about the most poignant moments they face in their Homecare work; questions such as “Am I going to die?” or “Can you really help me, and my family?” or “What is going to happen to me?” Hospice Savannah staff, using their own expertise and your inner resources, will help you and your family with all such questions and many others. Some of our patients do not die – they “graduate” back into curative treatment programs. Our managed care in your own home can make a significant and wonderful difference for you and your family. Most of our services are covered by private insurance or Medicare/Medicaid in addition to any patient applicable co-pays. For those individuals with no coverage, fees for service will be based on their ability to pay. Due to generous donations by the community and by the United Way of the Coastal Empire, services for patients with no ability to pay can be covered based on the availability of charitable donations. To start the process of receiving care from Hospice Savannah at home simply call our Referral Center (912.355.2289).